Ok that is basically it. If you want to know ALL the details or how you can get involved in these posts then I really suggest you go back to the first Tuesday Stamping post. The 4 polishes for today was chosen by Siobhan from For The Love Of Nail Art and she really wanted to challenge me. I was worried at first but I am never one to shy away from a challenge and the results were very interesting. So, challenge accepted! This is one of my newest polishes. I mentioned it here. I am not surprised that this one stamps quite well. It is a very pigmented polish. On the white it shows up very well. The smudged shadowing on my middle finger is absolutely my fault. What surprised me a little was that it did show up on the black. It wasn’t super bright but it does show up. Which means of course that it will show up on a colour quite well. I can already imagine it over a lighter blue. My findings: I think this is a great polish to stamp with. It shows up well on the dark and the light colours and stamps quite crisp and clear. 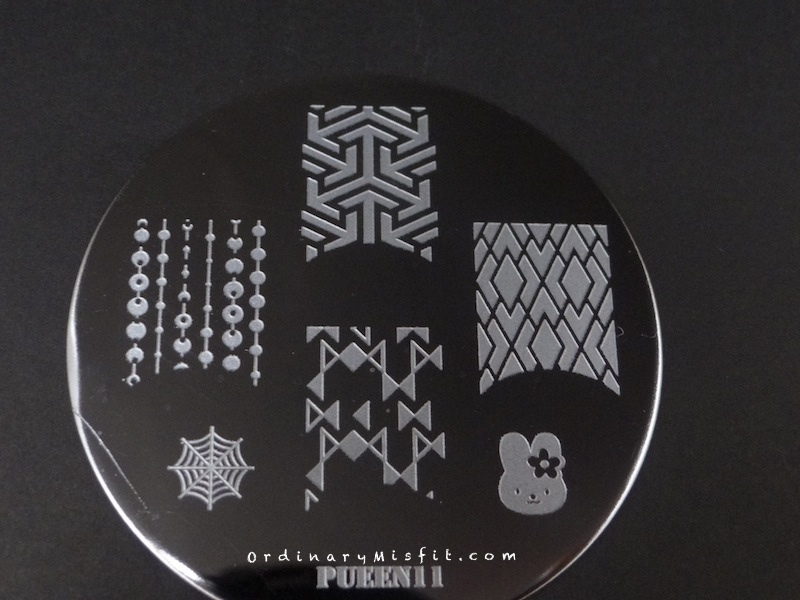 Definitely going onto my ‘suitable for stamping’ list. To be honest, I didn’t know what to expect from this one. Textured polishes seem to dry fairly quick and the as soon as it starts drying the texture starts to show up. I was surprised by how easy it was to stamp with. 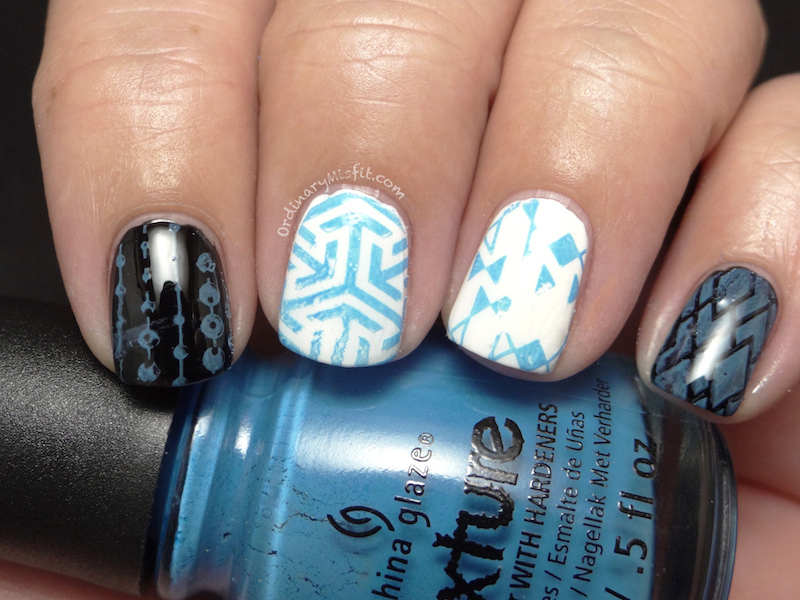 It transferred quite well onto my stamper and quite easily onto my nails. You can see on the white that the colour looks a bit washed out. I suspect there just isn’t enough polish left behind to really make the colour pop but it did stamp quite well. On my ring finger the thin lines are quite clear. On my middle finger though, the pattern almost seems a little messy. It does show up well on the black but the patterns aren’t very clear. So you can see there is something there but it isn’t too obvious what. I think if you used a single, perhaps bigger, image it might show up much better on the black. This is with topcoat. Before adding the topcoat I wanted to see if the texture showed up. It is slightly textured. I wouldn’t leave it without topcoat because the texture isn’t really enough to show it off. My findings: Surprisingly, stamps ok. I am not sure if I would use this to stamp with often but if I wanted something special I would definitely use this. Because it has the glitter it does look gorgeous. I was just as worried about this one as I was about Zoya – Chyna. I was again surprised by how easy it was to stamp with. I guess I really underestimated the textures 😉 It shows up quite well on the white. It doesn’t have the washed out look but it isn’t quite as bright as the polish is when wearing it on its own. The missing pieces on my ring finger was more than likely my error as I realised last minute I never checked if the polish was dry enough before stamping. Luckily it was. On the white, there doesn’t seem to be much glitter pay off. On the black however, the glitter shows up really well. On the black it doesn’t look as red but has more of a gold tone because of the glitter. This polish however does show the pattern much better than Chyna did on the black. A good place to compare this is on my index finger. The texture on this one without topcoat is barely there. I was a little more certain of this one because I know the polish is very pigmented and doesn’t have the glitter (although the above clearly proves it wasn’t a real problem). Of Coarse shows up really well on the white and the thin lines on my ring finger are nice and crisp. The middle finger pattern doesn’t look as crisp but considering how well all the others did I am sure that it is not due to the polish. It also shows up beautifully on the black. Both pinky and index fingers have nice crisp patterns. The texture on this one without topcoat was there but still not extremely textured. I didn’t love the look of it without topcoat though but you might feel differently when you try it. My findings: I am impressed with this one. It might not be much of texture stamping but the colour does look great. If I didn’t have another blue to stamp with I would definitely use this. That’s it for today. These polishes were really exciting to try. I really wasn’t sure what the outcome would be and all in all I think it was quite good. Even though I might not use these to stamp with often, at least now we know what the results would be. What do you think of them? Do you want to see any of them stamped over a specific colour? Do you have an idea for a stamped design you would like me to do? Do you have any suggestions for changes or additions you would prefer on these posts? I hope you enjoy these stamping posts. I am having so much fun doing them. I love your stamping posts! Prettiful recently posted…Style36 Beauty Box- Christmas Edition! 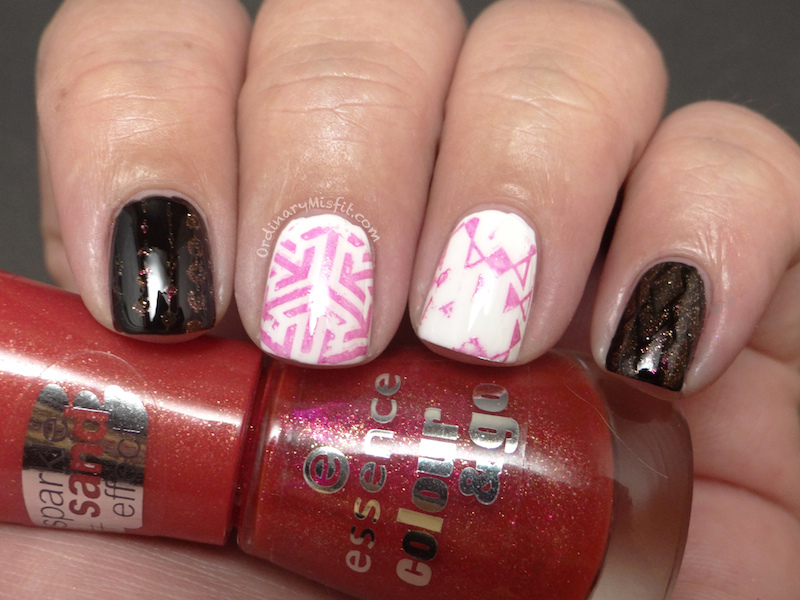 Yes I did, the comparison will be featured tomorrow (Wednesday) and I will definitely do it for the next stamping post. Great idea. Wow! I’ve wondered about stamping with textured polishes before but I never tried it because I figured what’s the point if it’s too thin a coat for the texture to show up. It does look pretty cool though with the glittery bits 🙂 Endless summer looks great!!! Yeah it does have a slight texture but not enough for me to not topcoat it. For me though. I definitely think you should give it a try. I also think stamping with an image that is a little more wide instead of a thin line might give more texture. I really love this post. Sometimes you wana try a different polish to stamp with and now well you know textures could work too. Thanks so much V. I agree, it is definitely a great option. Great ideas too! Loving your stamping posts as always M! I love how Chyna looks over the black. Gives it this pretty glittery look. Endless Summer is my favorite out of the bunch though! Thanks so much T!! I agree about Chyna, she looks gorge over the black. Endless Summer is my fave too!